Chicken wings: The perfect meal to share with a group of friends, a great snack for celebrations, the list goes on! They’re easy to eat at the bar or just hanging at home. While it’s not hard to find a place that serves up chicken wings, finding a place that you’d be willing to drive across town for is a different story! Whatever the occasion, our top choices for the best chicken wings in Nevada will satisfy. Choosing your favorite flavor of wings might just get a little bit harder at this wing joint. Their menu offers whopping 80 made to order flavors! The variety alone is worth several visits. Southern desserts that are made from scratch add to the overall package. A true wing master can appreciate the art of a new flavor. This cozy Chinese restaurant focuses on free range chicken and has developed their own spin on the wing. The Thai caramel chicken wings with crispy garlic are the best item on the menu. The only draw back to these wings is you may not want to share them, they are that good. Joe Bob's makes their wings fresh and hot as soon as you place your order. Never frozen or left to sit under a warming light, your wings are made just for you. They like to say they have the best breasts in the west, but we will leave that up to you to decide. Naked and baked is the house order. The wings here are fresh, never frozen. They are also never breaded or fried. The naked wings are topped with a signature sauce that you can customize. Service is their first priority and they are well known for being a “Cheers” type bar. Classic sports bar feel with great food. They do all the classic must have bar food and wings are what they do best. The menu may not have as many flavors as some of the bigger chains but the quality and taste sets these wings in a class all their own! This is the best place in Las Vegas to order traditional wings for game day. They are made quickly and ready to each with a variety of dipping sauces. 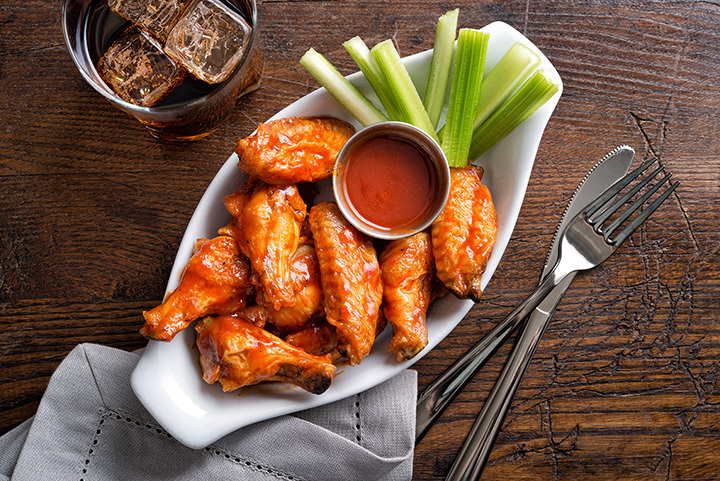 These wings are made to share with your favorite football buddies from the comfort of your couch. No one has to know your amazing wings were take-out! Once you try this family restaurant, you may just find yourself hooked on just about everything on the menu. Their smoked meats are amazing and the chicken wings are a gourmet meets southern cooking take on the game-day favorite. These are the wings your grandma would make if you could talk her into cooking for all of your rowdie friends. Wings like they are suppose to be! These classic wings are the go to choice for the college crowd because they are tasty and inexpensive. Everything is served fresh and made to order. Whether you like your wings rubbed, sauced or any combination of the two, the staff at here can make that happen. They focus on one thing and one things only. Wings is their “thing” and that's why they do it so well. Between the extensive list of sauces and rubs, you may just never run out of combinations to try. Pizza and wings often go hand in hand, so it makes sense to find great wings at a great pizza parlor. The wings are very traditional and done well. This is exactly what you expect for that game day wing in a sports bar setting.